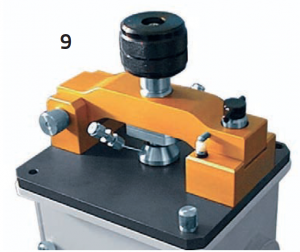 A variety of special anvils are available for use with the Golden Gate® Top-plates. 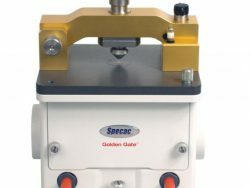 The use of an appropriate anvil improves the sample handling capabilities of the Golden Gate® Single Reflection ATR System. Samples which are sensitive to air or moisture can be loaded and pressed in a dry box. 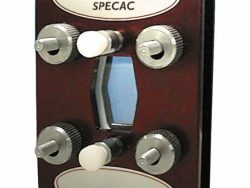 The anvil has a seal which compresses as the sample is pressed, thus keeping it in an inert environment while the spectrum is being run. (Narrow and Wide) To study the coating on transformer wire the grooved anvils hold the wire exactly in the middle of the diamond. 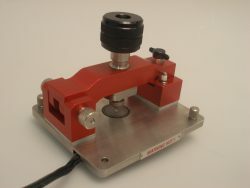 This is the standard anvil and is used for most sample types. It has the advantage of being very hard, and easy to clean to prevent sample carryover. It is also self-leveling to accommodate non flat samples. This is used for fibers or fine wires. It is not selflevelling, which can be an advantage with this type of sample. 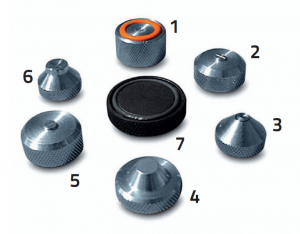 Polymer pellets are held firmly in position with this concave anvil. With a flat anvil they could move when pressure is applied. If liquid samples are very volatile the cover is useful to minimize evaporation. 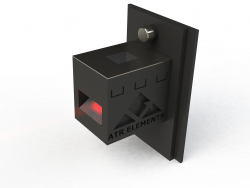 The View-Thru Anvil allows the sample to be viewed through a 4x lens system with a built-in reflective illuminator. 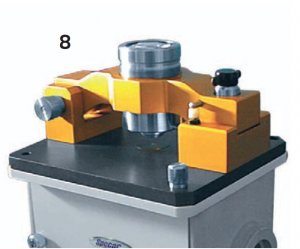 This micro flow cell anvil seals under pressure around the diamond. 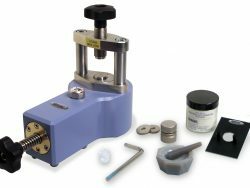 Its volume is 28 microliters and it can operate at 1000 psi. 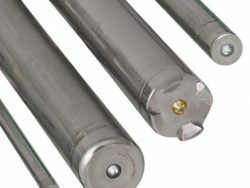 It may be used as a flow cell or as a micro reaction chamber.